An acoustic guitar is a stringed instrument with a long neck, a round sound hole, and six strings that are plucked by the fingers or picked by a triangular, soft plastic pick. The two most common types of acoustic guitar are the steel-string guitar and the classical guitar, also known as the Spanish guitar, which uses nylon strings. Steel-string guitars are louder and brighter in sound, while classical guitars boast a warmer, mellower sound. Parts of the guitar include the headstock, nut, machine heads, fretwires, truss rod, neck, heel, body, bridge, bottom deck, sound board, body sides, sound hole, strings, bridge saddle, and fretboard. The head stock is at the end of the guitar neck, fitted with three machine heads on each side that adjust the tension of the strings. The nut is the joint where the headstock meets the neck; it has grooves guiding the strings onto the fretboard, also known as the fingerboard. Frets are the spaces between the fretwires; they also indicate fractions of the length of a string. The truss rod is an adjustable metal rod running along the inside of the neck; it is common in steel-string guitars, but rare in classical guitars. The neck comprises the guitar's frets and fretboards as well as its tuners, head stock, and truss rod. The heel, or neck joint, is the point at which the neck is bolted or glued to the guitar's body. The body consists of the guitar top, back, sides, and sound board. 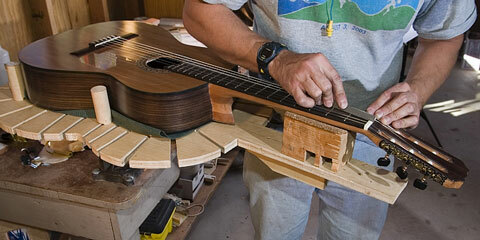 The bridge holds the strings in place on the body, and transfers the vibration from the strings to the sound board. Acoustic guitars are built by artisans know as luthiers. Luthiers may also build and repair other stringed instruments including violins, violas, cellos, double basses, lutes, and mandolins, but most modern-day luthiers make a living specializing in guitars. An acoustic guitar may be constructed of solid tonewood top, sides, and back, which are often spruce, rosewood, maple, or mahogany. Lower-priced guitars may combine solid tops with laminated back and/or sides, while entry-level guitars are usually made entirely from laminated tonewood. Guitar necks are usually made of mahogany, and fingerboards are made of dense tropical hardwoods such as rosewood or ebony. Building a quality guitar is an art form, as the sound or "tone" of the guitar is completely dependent upon the shape, quality of wood, and construction methods used. Find out how different woods contribute to the overall sound of an acoustic guitar. 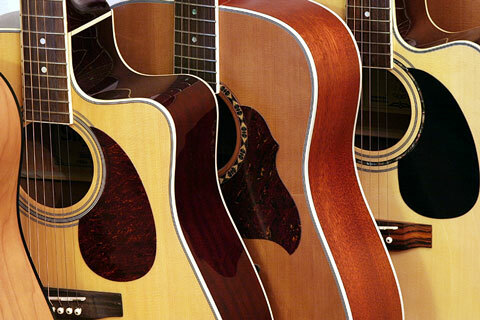 Learn about major components in the manufacturing process of acoustic guitars. Find strings for acoustic guitars, banjos, mandolins, and bowed instruments. Manufacturer of coated guitar strings for a great, long-lasting tone. Find a variety of strings manufactured by Martin Guitars. Find strings for your electric guitar, acoustic guitar, mandolin, or banjo. Guide to bass guitars and guitar accessories. Guide to electric guitars and their makers.